Good day to you darlings! 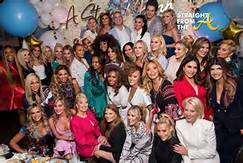 In what can only be described as most of mine and my friends’ version of SuperBowl, Andy Cohen had a “Star Is Born” themed baby shower for his baby boy that is expected to be born in six weeks at The Palm in Beverly Hills over the weekend. The shower was hosted by Kyle Richards, Teresa Guidice, Ramona Singer, NeNe Leakes and Vicki Gunvalson. Around 30 of the Housewives from every franchise turned up for this bash. John Mayer, a good friend of Andy’s was also there. Never have so many plastic surgeons been available on speed dial in one room. At one point in the party, Lisa Rinna instructed all of the Housewives to get on the tables and fxxxcking dance. They danced and twerked and drank. Kyle Richards even showed off some of her famous splits. It became a “Housewives Gone Wild” party. Gotta love those Xanax smoothies. Well thanks for clearing that up Samantha. This may be the press she’s looking for as she is currently writing two tell -alls (because one isn’t enough) called “In The Shadows of the Duchess 1 and 2. I can’t wait to see what kind of story she has to tell considering she hasn’t shut up since the wedding. What kind of pictures will she share? She promised she would share a lot of them. Are we going to see Meghan doing embarrassing things? I want to know! And now, back to the story of wealthy and elite hipsters getting defrauded by wealthy, elitist grifters. The NY Post is reporting that various models and social media influencers who were used to promote that Fyre Festival train wreck, may be forced to testify about it. The list, according to new court filings, includes Bella Hadid, Kendall Jenner, Hailey Bieber and Emily Ratajkowski. They’ll need to talk about payments they received from the organizer, Billy McFarland, who is in jail for the next six years. There have been no reports yet about whether or not Ja Rule will be asked to testify, but he tweeted that he too was hustled and scammed. I don’t know…seems like as the co-founder of this festival, he had to know something (everything) that was going on. Also, most importantly, why would anyone think Ja Rule was doing anything cool? Is it 1994? Personally, I can’t see Gwyneth doing something so crazy. In what world is Gwyneth going to ski into a man, break his bones and walk away? I just don’t see it. . Her reps deny this incident occurred and say that she will “be vindicated”.